Today, we are featuring a two part special in our first 2013 post. So with no further ado, here's just one of the many pictures of doggie drama in our household. More to follow this January! 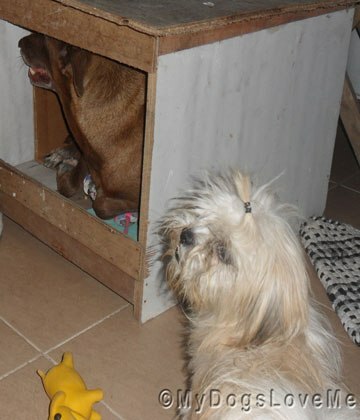 Chooey, the tiny terrorizing Shih Tzu, barking mad because Rin's in her dog house. I decided to bring Chooey's dog house down to the second floor just in case she wanted to hide from the booming noise of the fireworks. I also placed a box in it because I know for a fact that Chooey likes boxes just like the Woos. Rin hasn't been desensitized from the noise and she's such a scaredy cat. So, while trying look for a hiding place, she decides to seek shelter in Chooey's small dog house. And this drove Chooey crazy because it was her house! Fortunately for Rin, the tiny dog terror was preoccupied during the night's events. Okay, for our second part... This post is brought to you by Vet Medic. Adaptil is simply a product that has been developed to help support dogs through various challenging situations. These challenges include fireworks, first night of puppies away from their mother, training; specifically puppy classes and agility. In addition, a dog or puppy travelling on a car for the first time, having to stay away from home, and loud noise among other reasons. These factors can cause stress to the dogs. Most owners do not recognize these stresses and hence they worsen going unnoticed. This behavioral change can lead to a few problems which may become harder to deal with in the future. Your dog can, therefore, stop playing, become more nervous, shaky or even hide. 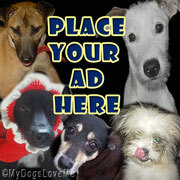 Many dog organizations use Adaptil on their rescues. The product come with a money back-guarantee because of its effective and positive results. It is, however, not advisable to use this product on hyperactive dogs. It can be used under the advice of a vet or behaviorist alongside proper training so as to help in the management of the dog’s behavior This management helps in clinical-behavioral problems like separation anxiety, fear, noise and many more. The effects of Adaptil can be realized within 14 days for the Adaptil Diffuser and improve further over a month. The total duration for use depends mainly on the condition being treated but normally, it is up to a maximum of three months. It is easier to use Adaptil which is available in three common convenient forms. It is available in a diffuser, discrete plug-in which releases odorless pheromone, and a spray that can be applied directly to the object-areas. There is also an Adaptil collar that is normally used to encourage the diffusion of pheromones into the local environment and to help the dog adapt more comfortably. Adaptil for dogs has no side effects. It has been scientifically proven that it is about 75% effective in dealing with problems that relate to behavioral changes such as anxiety, fear and help in establishing pets into a new home. However, despite these many advantages, Adaptil requires to be left in an active power point for about 24 hours a day and at least for a month to be effective. Pheromones are also always not a certain cure for some target behaviors. It is also a costly product and you will have to depart with some extra money. Adaptil is a non-prescription product that has been proven to control signs of stress in dogs. It helps to reassure them comfort so that they are able to cope with the new changes of environment or hypersensitivity. Many trials have proven that Adaptil has positive results especially on helping puppies to settle into a new home, and more so in puppy socialization. For adult dogs, trials show that Adaptil helped adult dogs stay in kennels, settle in a new home, deal with fireworks and during car travel. It is important to monitor your dog’s behavior so as to determine when to get Adaptil. This is especially important when you have recently relocated to a new area or are travelling with your dog among other signs. Have a Happy New Year, everyone. We plan to see you in your bloggies very soon! Oh oh. Maybe it's time you found yourself a larger "house" for yourself, Rin! That looked like a very tight and uncomfortable squeeze...AND with that tiny loudspeaker blaring right by your side! Those fireworks sure are scary huh? Oh we don't like fireworks. I hide under the bed. Happy 2013! We agree fireworks are scary. Happy New Year, let's have a great year! We had a ton of fireworks here on New Years Eve - luckily we are ok with them but we really felt for all those pups who aren't. Fireworks can be VERY scary!! We agree that boomy noises aren't much fun. Why we decided to sit on our humans' laps on New Year's Eve just so they wou;dn't be afraid of them. Isn't that generous of us? MOL! Happy New Year and get out of my house, LOL! It is like when my husband encroaches on my side of the bed. Don't be scared of fireworks, OK? Floyd and I did our best to tell those noisy fireworks to get lost! We BARK-BARK-BARKED at them! Looks like you need another pup palace...or two! Nobody here likes fireworks but YoYoMa gets particularly upset and hides under the blankets in Puff's crate. We use and herbal chew called Composure for the nights when there are loud noises or storms...eases stress and calms. Happy New Year and wishes for a year of peace and plenty.